We have found a video about SIM boxing in Uganda, made it’s transcript and got some awesome insights. Firstly, the most interesting point is that people and government evaluate SIM boxing activity totally different. The below comments represent what people think about SIM boxing. Six suspects whose names were withheld were arrested yesterday following the involvement in an illegal act named Sim boxing. According to the Uganda Communications Commission PR Pamela Akunda the suspects used metallic boxes where more than 250 SIM cards are inserted and through technology they are enabled to allow illegal termination of calls. “Use technology to illegally terminate international or local calls. This is really done in a box where SIM cards are inserted and through technology enabled interfere or otherwise to get into a licensed operator systems to allow illegal termination of calls. 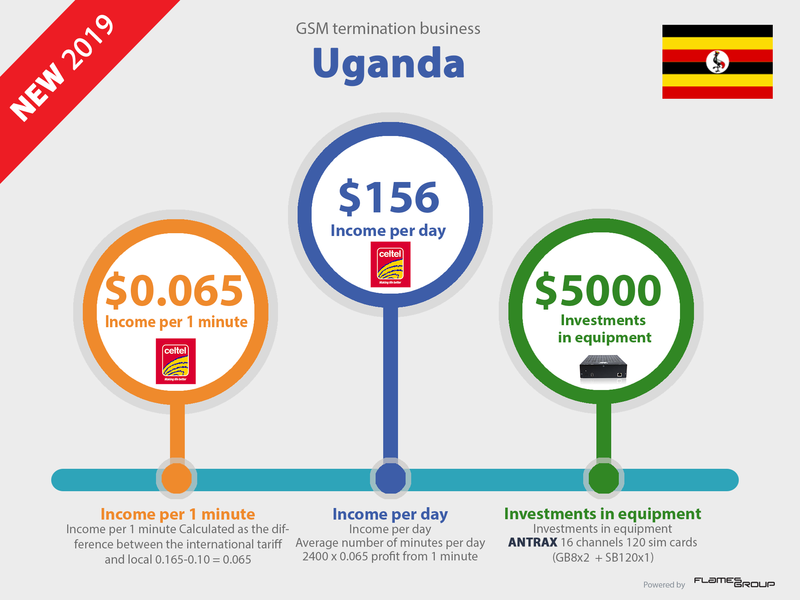 Yes, GSM termination is profitable from countries where the rates to Uganda are extremely high because of extra profit of GSM operators. Here is an example how routes to Uganda are offered/requested. These machines that allow illegal termination of international and local calls include a generator, wires with small antennas, boxes that allow insertion of SIM cards, mobile phones – among others. Acunda says that the suspects had been involved in these illegal activities for six months now and this fraud had led to loss of government revenue. By official data sources, GSM terminator could earn up to $10’000 a day depending on equipment – here is one more proof. By our estimate, with the investments of $4000-$5000, GSM terminator can earn $150 daily. So with a minimal configuration and average estimates they could earn almost $30000. Not bad, right? even with this equipment they could close in 4 month before being detected with getting 300%-500% or ROI. The suspects are expected to be produced in a court tomorrow. Yes, definitely there are many GSM terminators that do this voice traffic termination at their own risk. But not doubts, that smart guys using quality equipment with smart software and wide business contacts could do GSM termination and earn much money. The officials say SIM boxing is still rife.